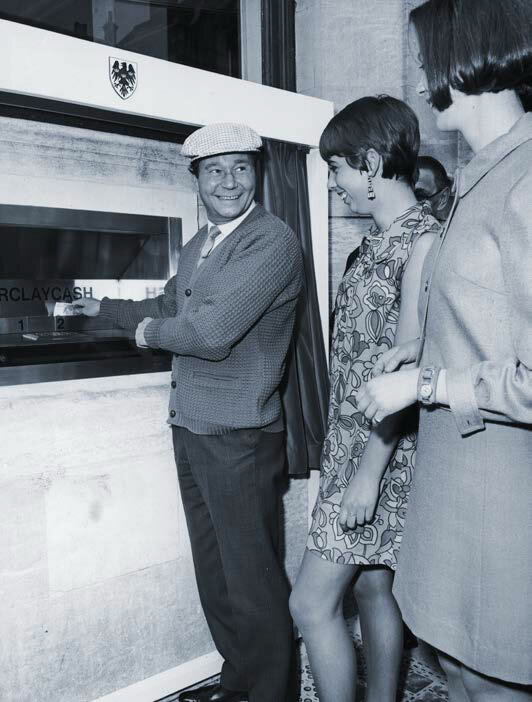 The first Automated Teller Machine was installed at a branch of Barclays Bank in Enfield, north London, on 27 June 1967. Shepherd-Barron was the managing director of De La Rue Instruments. A division of De La Rue the banknote and credit card printing firm who produced more than 140 currencies, as well as stock certificates for the New York Stock Exchange.. John's inspiration for the ATM came one Saturday in 1965 when he had gone into town to take some money out of his bank, but he had arrived one minute late and found the bank doors locked against him. While taking a bath that evening with no spending cash he wondered if vending machines can dispense chocolate bars why couldn't banks have a machine to dispense money? Later that year, he met with the chief general manager of Barclays Bank. Shepherd-Barron asked him for 90 seconds to pitch his idea for a cash machine. He said, 'Come and see me on Monday morning'. Barclays asked for six cash dispensers, the first of which was installed at a branch in the north London suburb of Enfield on June 27 1967. The actor Reg Varney, star of the ITV sitcom On the Buses, was hired to promote the device. They were officially called DACS (De La Rue Automatic Cash System). In 1969 he described the system to the conference of the American Banking Association, but received a lukewarm response and only one sale. Plastic bank cards with magnetic strips had still to be invented, Shepherd-Barron's early machines used special cheques called "Barclaycash" that were chemically coded with impregnated carbon-14. Customers placed the cheque into a drawer, the machine detected and matched the cheque against a number code entered before paying out a maximum of £10. Shepherd-Barron's machine trail-blazed the industry to improve the technology and De La Rue's machine was soon surpassed with the advent of bank cards with magnetic strips and PIN codes. 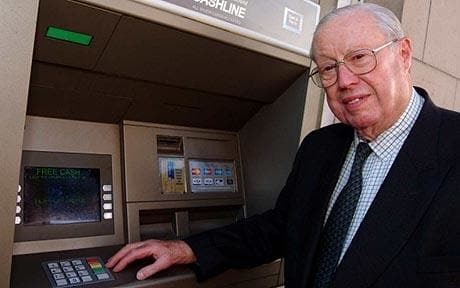 In 2004 for his services to the industry, and his work on ATMs in particular, he was appointed OBE. Previous 'cash machines' like the 'Bankograph' were primarily deposit points.